Giving users complete control of their online experience has always been a core tenet of Windows Live and this hasn't changed with the What's New list feature in Windows Live. This feature enables users to view an activity feed of what members of their social network are doing AND to provide an activity feed of what the user has done recently. You can see an example of the latter on my Windows Live profile. Listed below are the various ways we keep users in control of their online experience related to this feature. By default a user sees activities from members of their network and from groups they are in. However users can opt out of getting activities from any member of their network or from any group they are in without breaking their relationship with that user or group. In addition, users can also opt out of getting activities of a specific type (e.g. friend additions or Twitter updates) from members of their network. We provide two entry points for managing what updates you get from your network. First of all, users can manage updates from a particular user or update type by hovering over the item in the dashboard and clicking on the gear icon. The users, groups and applications that are currently blocked can be viewed on the What's New settings page at http://profile.live.com/whatsnewsettings. This is what that page looks like for me at the current time. As you can see from the above screenshot, I haven't hidden any update types from my What's New list. I did add the "Paintballers" group to my list of hidden groups though. Although I like getting paintballing events in my calendar, I'm not interested in discussions or photos about paintball on a regular basis. It should also be noted that each update type typically has a permission associated with it. This means that a user can control who has access to a particular photo album, their shared favorites or even their Twitter stream (as shown below). 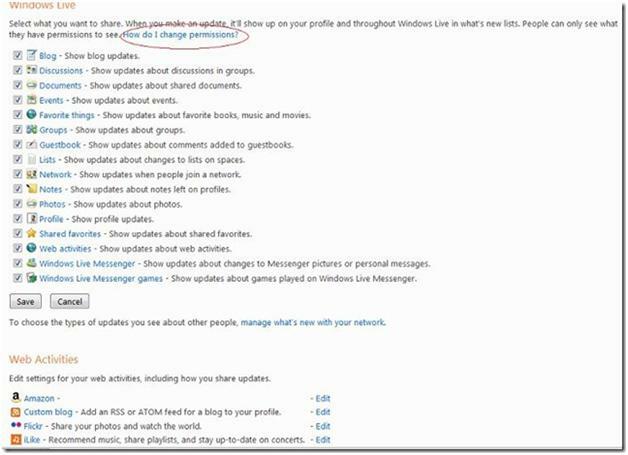 That way you can still broadcast updates to your friends on Windows Live without worrying that you are accidentally sharing inappropriate content with your boss or coworkers. 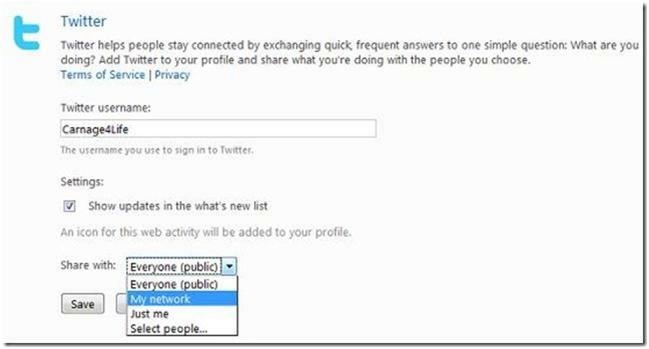 In addition there is an options page where users can completely opt out of broadcasting updates from Windows Live to members of their social network. For example, I know someone who'd rather not have it broadcasted whenever he changes his status message in Messenger since he believes they should ephemeral thoughts and not captured for posterity. 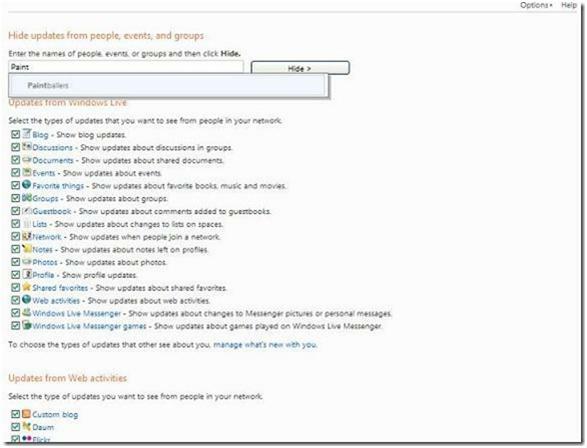 This options page also allows configuring updates from other web sites that are being aggregated on the user's profile. The What's New with you settings page can be found at http://profile.live.com/WhatsNewWithYouSettings. So you can see when it comes to activity feeds in Windows Live, our mantra is to keep users in control. Let me know what you think of our approach in the comments.